Personal consumption is 70% of the US economy. While much of this is Government controlled (Medicare), untethered to actual consumer choices, it’s a large enough number that many focus upon consumer health and sentiment for clues to economic trends. 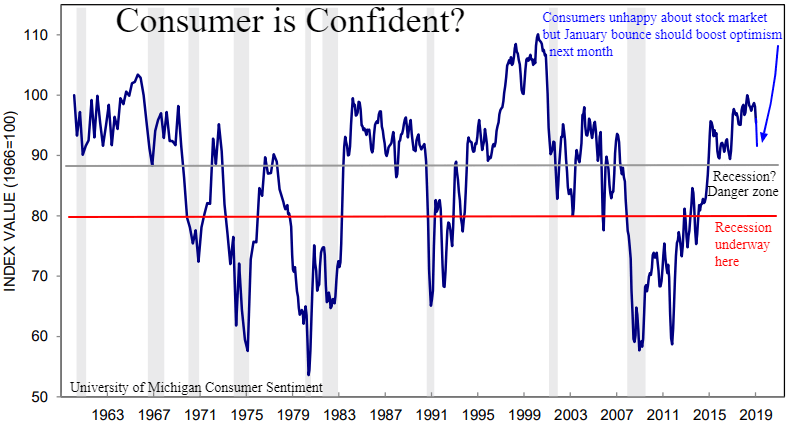 After reaching a euphoric 18 year high a few months ago, confidence has fallen to 2-year lows as of early January. The economy would be in trouble of stalling if workers became increasingly pessimistic and curtailed normal spending habits. In the big picture, this measure of sentiment remains healthy with the current drop likely to reverse upwards with the resplendent stock market ascent of the past few weeks. The consumer has buckled but will remain unbowed if the US Government reopens and the China trade dispute is resolved. Another measure of personal consumption is illustrated by Redbook’s same-store sales results. 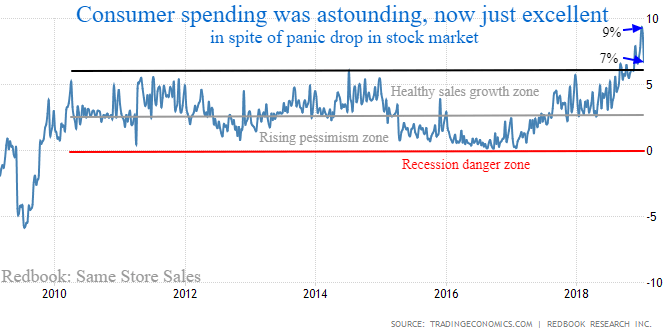 Despite the slow economy during the Obama era, we maintained robust spending habits that never witnessed the same-store sales in contraction. After the Trump tax cuts in 2018 juiced what may be the best annual GDP growth in 14 years, same-store sales surged to a record 9.3% growth rate over the holidays. Despite the drop in consumer confidence, there has only been a tiny downshift to 7% sales growth. We suspect same-store sales falling back to 4 to 5% growth rates would be normal in a good economy. There are no warning flags here yet. Personal income and wages are of course another measure of consumer health. More companies increase wages during economic expansions and very few will elevate compensation during recessions. Clearly, employers, today are sharing their good fortunes as a record % of small businesses have boosted pay for their workers in recent months. These 59 million employees in the small business sector have more spending power to sustain the economy as long as the politicians don’t fumble the ball on Trade and symbolic Government shutdowns. A new deal with China could be a bad thing, as it means even less reserve currency bolstering the world economy as if our trade deficit could really be erased!